I've never been much of a poutine person. This is why Poutine Week in Montreal was so good to me: so many different types of poutine, so little fries-brown-sauce-squishy-cheese trios :) It was, like, calling out my name! Out of 30 poutine places, about 27 were offering non-traditional poutine. That made me happy. VERY happy! We 'teamed up' with one of my school friends and her bf and set out to our first choice (out of 30) of poutine places on Monday. We chose La Mauvaise Réputation. Who knew we would end up going to 2 other restos that night and to... 7, yes, SEVEN others that week (for a total of 8...EIGHT!!!). 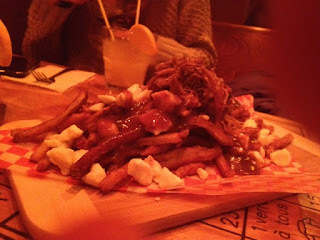 Every resto chose one poutine (or two) and it was either supposedly 5$ or 10$ (sometimes 13$ or 15$ $%/?&*). Every restaurant would give you a 'Poutine Week' card with a code on it and you could go vote for them on the Poutine Week website. This gave you points and then you could cash in your points. We actually both chose a 30$ gift certificate at Bota Bota. Not too shabby! Place: New restaurant, very cute . LOVED how when you get in, there's somewhat of an indoor abri Tempo and you don't feel the cold at ALL when you're seated. Nice. Very nice. There's a big window right at the front of this long resto and around it is a brick wall. Who doesn't love a nice brick wall I ask? I think our favorite thing that day, in that resto, was that right beside us, there was a shiz load of heating. May I remind you that it was -40 ish outside. Brrrrr. The music was nice and neutral and lounge-y. Service: The waiter was very nice and friendly and we got our [paper] menus quickly--perhaps because we were actually the first ones in the resto. I think it was about 6:30. Throughout our meal, the waiter also came back to re-serve the water, which was nice. The menu itself was nothing to write home about --hamburgers, noodle soup... We were obviously only interested in poutine. Poutine: Pulled pork poutine. Pulled pork, caramelized onions, coleslaw, smokey chips. We decided to share 2 poutines and to add a couple sides which are not really even worth mentionning here. Poutine got to our table and we were immediately happy. It was in a square bowl and it was vertically inclined instead of flat which made my eyes happy. Eat with your eyes first, right? The main part of the poutine was the pulled pork. I loves me some pulled pork! And the sauce the pork was marinated in had a wonderful mix of spices. The coleslaw was actually a nice addition to the poutine as it was refreshing and it went well with the rest of the ingredients. Oh, and the smokey chips were great and a good fit too but obvisouly not homemade. The caramelized onions, on the other hand, were not so present. I believe there was only one... maybe two in the entire poutine. Also, the sauce was a bit too liquidy and agglomerated at the bottom. All in all, a very good start to what was to be an epic (that's right, epic!) poutine run throughout the week. And that pulled pork was a winner! 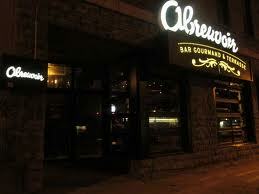 Place: If you didn't have the address to this restaurant, you would definitely miss it. Most definitely! When you come in, it looks a tad fancy but then you see the tv. pfff.... damn tvs! Open kitchen, wooden everything including the menus (except for the tables, which were plastic... seemed like they ran out of money...), and lots of people! There were also huge drapes coming in to 'take care of the cold' but that didn't work out as well as they had planned. Service: Nothing special. Got water and that's it. They were really busy. Poutine: General Tao poutine. Cheese curds, battered chicken, original General Tao sauce. This was supposed to be my favorite poutine. I mean come on! General Tao? I LIVE for good General Tao! But man was that one ever disapointing. The fries were obviously bought and not homemade, the chicken was meh and the sauce KIND of ressembled the sweet General Tao sauce but it wasn't close enough. Also, it was 13$ instead of the 10$ we thought it was going to be. Another thing... it was lukewarm. Uncool. Place: This place was full of people and so we had to wait... but only for a couple minutes! The decor is nothing special: frames and IKEA lamps, stucko (nice ;p) and pop corn ceiling, with tight seating room. It's the type of place you go to with friends to enjoy a nice... poutine! Duh! You can also 'make your own poutine', so that's pretty cool. We were seated next to a vacuum cleaner. Fun. Service: Took a while for the waitress to get to our table and longer to get water. She was nice nonetheless and gave us a great suggestion concerning which potatoes to have our poutine with. We took l'écrasé de patate (specialty of the house. Other choices include sweet potato, julienne, or 'coupe maison'): clumps or agglomeration of potatoes, which turned out to be quite good. Quite freaking good. It did take a while for the poutine to arrive to our already full stomachs...But our waitress was nice and smiley and that is gosh darn important. Poutine: Le Montréalais. Swiss cheese, mushrooms, smoked meat and breaded pickle on potato écrasé poutine. I'm already not a fan of poutine, but I think I'm even less a fan of smoked meat. The only time I went to Shwartz, I ended up eating a pickle. This poutine, I believe, changed my mind. First of all, that pickle (which we had to share four ways) was damn good. And thank you, waitress, those potatoes were damn good as well. Well seasoned but most importantly, well clumped :p The mix of flavors was DE-licious and it was so good that it turned out to be my two friends' best poutine of the night. The mushrooms were a nice addition to this lovely surprise. The smoked meat wasn't half as bad as I thought it was going to be. As I mentioned, it may have changed my mind about smoked meat. It was very nice in this poutine. Very fitting. Not as salty as I thought it was going to be. It was missing something for me though. Missing an OUMPH. THIS is the one we were supposed to go to on that first day but it was closed. It was the one that was most appealing to us anyway. 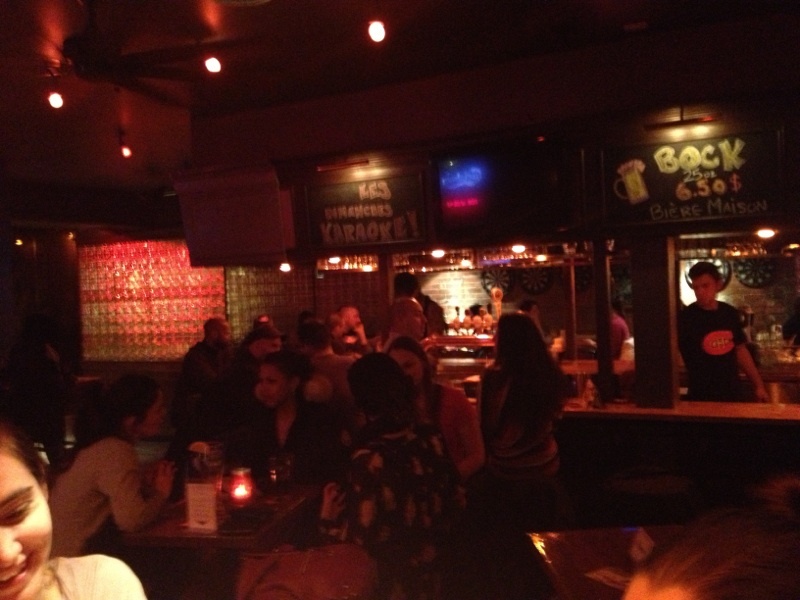 Place: Not much to say; it's a bar that looks like a bar. Lucky's truck is usually, well, a truck but in the winter, the food is served in the bar L'Abreuvoir on Ontario corner of St-Denis. Service: Thing that sucked was that A: we needed to have a drink since we were in a a bar and that B: it wasn't clear who was serving what (food, drink?). The 'drink girl' came by quite quickly but the girl that was serving the food was nowhere to be found... for a while. Oh and we had to pay two different bills and since it's a bar, we had to pay cash. Pfff. Poutine: La fameuse. Duck confit, caramelized onions, foie gras sauce and red wine. As I mentioned before, this was supposed to be THE poutine. I mean, come on... it had duck in it! Duck! But alas... it was cold, the sauce wasn't as present as we wanted it to be and the duck was dry. One of the only good things was that the fries were good, at least! Basically it sounded way better on paper than in my mouth. And the caramelized onions? Where were they? Well they weren't on my plate. Nice presentation but maybe not the best vehicule for a poutine? Service: The waiter was very nice, professional, and came to our table quickly. A bit TOO quickly: there were two poutines and I couldn't choose which one! He came back and took our order a couple minutes later. Poutine: Fricadelle, oka, cheddar, confit pork flank and tempura onion rings. All of this on baby potatoes cut in half. This was our 5th poutine of the week and after eating it, ze wife claimed it was her favorite one (or so she thought ;p) I must also mention that there were 2 different kinds of poutine, none of which were actually on the Poutine Week website. The onions were crunchy (as they should be) and delicious and the cheddar was damn good in there. One thing that didn't fit was somewhat of a big fat meatball right in the middle of the poutine. Why? Why was there a big fat DRY meatball there? To remind us that we were eating at Le Méchant BOEUF? That part, we could have done without. This poutine was huge, even if we were sharing it. The mix of flavours (uh... not counting the meatball), was great, the pepper sauce was well done and there was just enough. Asking ze wife, it was her fave, considering the other 4 we'd eaten. Service: The waitresses wore white and red and were very smiley, which is always appreciated! Our waitress came quickly and gave us glasses of water and took our order. Wasn't that hard... 1 poutine for the two of us! The one thing that was less appreciated was the fact that the waitresses were talking (about their personnal stuff) between themselves in a corner, in plain sight. Gosh, I hate that. Oh and the big boss was lurking the whole night which started to make us feel uncomfortable! Poutine: Italian sausage poutine. Italian sausage, mild cheddar, onion confit, peppers and fresh herbs. The sauce was good with just enough salt but if you didn't have either a piece of onion or pepper in your bite, it didn't have that much taste. There wasn't that much cheese though. A good mix but not enough taste, I found. And ze wife didn't think very highly of the fries.Good thing was the sausage. THAT was goo-hoood. I just wished there would have been more than half of one! Place: This place was tiny, with about 20 seats all together. Most tables were high ... only a couple were 'normal height'. They make lots of good things like yummy salads and sandwiches. That's why they are a caterer, first and foremost. Service: There were two waitresses, I believe and they were everywhere at once! It was even hard to get a price off of them... like the price of a glass of wine (which turned out to be 10$ for a glass... tad expensive!). Needless to say it was very busy during the lunch hour. The boss/owner was running around, swearing because the heating wouldn't work. Funny but unprofessional. Place: The place itself is quite hip looking, with lots of sun coming through the large windows. We had one of the best spot, but maybe that's becaue it was about 1:15 when we got there. Service: Our waiter, who seemed to be more of a manager or even owner, was very nice and friendly. He was very interested by the fact that this was our eighth poutine of the week! And, he came to check up on us and the poutine. Poutine: Breakfast poutine. Homefries, sqeaky curd cheese, caramelized peppers and onions, hollandaise sauce, poached egg. Yum yum yum! The potatoes were crunchy, the peppers were well done and the presentation was just lovely! At first, i gotta say I was scared of the egg on top but it was just deeeelicious! On top of it, the plate AND the poutine were hot. You know how much I like hot plates by now! Everything was well seasoned and we were so happy that we went for that 8th poutine after all! ps: They make maaad mimosas (you can actually choose other flavors besides orange juice)! That's it for us and poutine week. After rating the poutines on the poutine week website, we ended up ranking 15th out of 4356 something poutine eaters. Ain't that bad huh? I guess I AM a poutine person now!